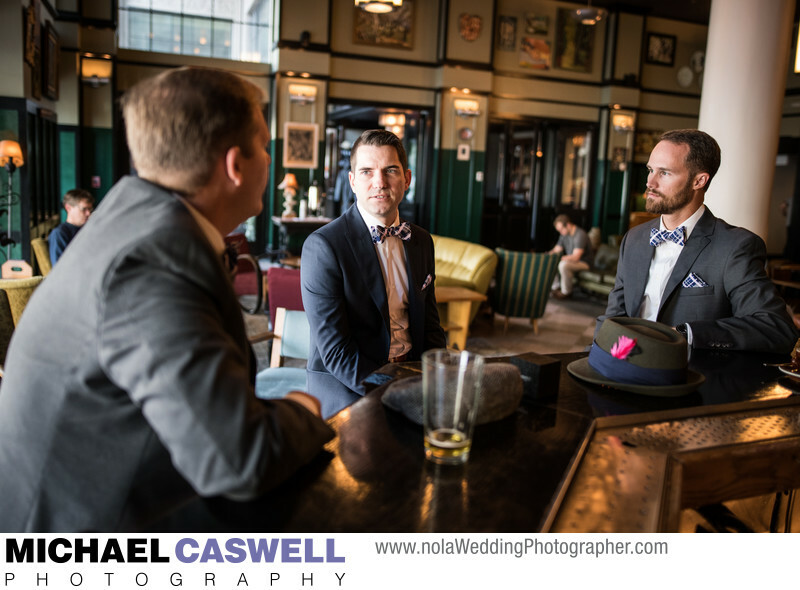 I do sometimes get pictures of the groom and groomsmen as they're getting ready in the hotel room, but I find that the best pre-ceremony photographs of the guys are taken either as they're hanging out at the church or other ceremony venue, fixing each other's ties and such, or sitting at the hotel bar, as was the case with these guys at the Ace Hotel in downtown New Orleans. They'll tend to be more relaxed and comfortable in this kind of environment, and the resulting pictures reflect this. This particular shot was captured with available light, thanks to the large windows to the left of the camera. The Ace Hotel was, conveniently, also where this couple's wedding took place. It was an intimate ceremony and brunch reception, with a festive second line parade in between. While the hotel does have larger event spaces, the small courtyard area was perfect for this couple, as they only had a dozen or so guests in attendance. Location: 600 Carondelet St, New Orleans, LA 70130.